“Teaching kids that highlighting is not painting the barn.” —Patricia B. “Getting students to understand the different aspects of text worthy of notation—main idea, significant detail, theme, etc.” —Melissa W.
“Convincing them it’s necessary.” —Amy S.
With these comments in mind, “We are Teachers” created a brand-new classroom poster to help you teach kids smart highlighting skills. Plus, don’t forget to save and pin the exclusive educator infographic, which has more ideas for teaching annotation in the classroom. You can download these posters in high quality and print out to hang them on your wall. 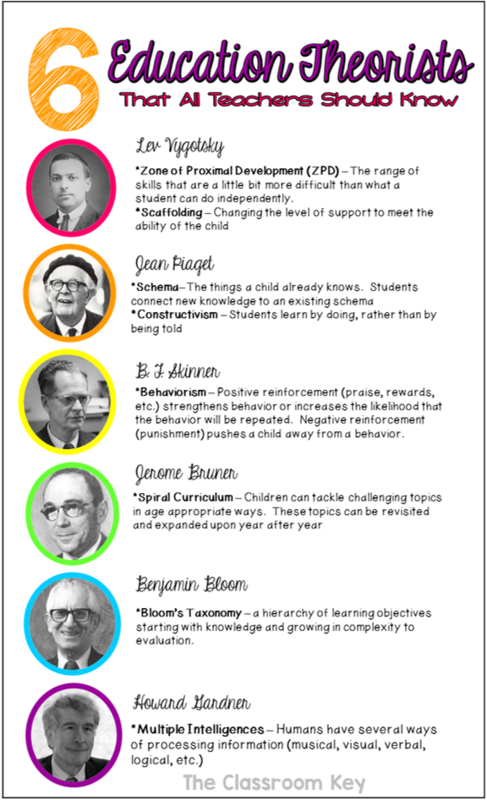 The 6 Education Theorists All Teachers Should Know present 6 people that did some of the major research in education. How do you decide the level at which to instruct your students? Vygotsky says to determine their Zone of Proximal Development (ZPD). This means the skills that are just a little bit beyond their reach. When you are working with a small reading group, don’t pick books that kids can read perfectly. Pick ones that are just a little bit challenging, that students will need some support to read. Eventually a student’s ZPD bumps up higher because they have mastered the skills you were supporting them with. Scaffolding is not a term that Vygotsky actually used but it’s a concept that developed based on his work. When you scaffold a student, you give them support to complete a task that they can’t quite do on their own. For example, at first, students need to be walked through every step of long division. Gradually the scaffolding can be reduced. Maybe they just need a couple of reminders at tricky spots. Eventually the scaffolding can be removed because the student can complete the task on their own. Piaget was a constructivist which means he believed that kids learn by manipulating, modifying, and otherwise working with concepts. They construct their own learning rather than just being told something. Piaget worked with the idea that the things people know are organized into schemas. When a child learns something new, they either assimilate it into an existing schema, change their schema, or develop a new schema. Do you activate background knowledge before a lesson? You’re helping students tap into their existing schema! When I taught second grade and my class was on the wrong track, I would look for the one kid doing the right thing and say, “Wow, I love how Jesse is standing with his hands to his side and his voice turned off.” As I positively reinforced this behavior with praise, other students would jump on board, too. This is the heart of behaviorism. It’s the idea that praise and rewards positively reinforce a behavior and encourage kids to continue with it. Punishments discourage students from a behavior. Beyond following rules, there are learning actions we can reinforce. If you display quality student work, praise students for using strategies, let students publish on cool paper when they have their writing perfect, etc. you are using behaviorism to guide students toward the behaviors and actions of successful adults. If you have decent curriculum to use, you’ve probably seen Bruner’s idea of spiral curriculum at work. Elementary students can’t design roads and bridges but they can begin to learn about the physics of how the slope of a ramp effects the speed of a ball rolling down that ramp. Each year they can revisit and build on their previous learning. You may have heard of Bloom’s Taxonomy. It’s a hierarchy of intellectual behaviors. The lowest level is remembering facts. The highest level is using your knowledge to create something new. With the new Common Core standards we’ve heard a lot about increasing rigor for our students. One way to do this is to make sure we’re involving our students in higher order thinking activities at the top of Bloom’s Taxonomy, not just in memorizing facts. Gardner found that people have more than one way of processing information and that a typical IQ score doesn’t completely measure intelligence. He created the theory of Multiple Intelligences. In the classroom we can engage multiple intelligences by singing educational songs, allowing students to work through concepts verbally, through art, through writing, with partners, and through movement. I bet a lot of these theories already guide your teaching and now you know the researchers to connect them to. Pin the image above for handy reference! The proportion of tutored pupils has risen by more than a third over the past decade, from 18% in 2005 to 25% currently. In London, 44% of pupils had private or home tuition last year, compared with 34% in 2005. The number of tutors offering their services has increased dramatically amongst the independent sector because leading schools are raising the educational bar each year, as well as offering fewer places and taking only the absolute best candidates from as young as 4 years through to A Level. Classrooms are proportionate and legal to ratio, but they are large and this doesn’t always mean your child will get the absolute maximum attention required, especially if struggling somewhat. This has made our exceptionally qualified tutors here at Bright Star even more in demand. We not only offer tutoring, but curriculum guidance, school advice, skill and technique practise, emotional and social support, assessment and report feedback, interview practise, targeted help alongside ‘Step and Technique Practise,’ a tailored and mastered Success Criteria, bespoke to Bright Star that carefully guides your child in the right direction to map out their thoughts and ideas with the help of our Criteria. We understand the requirements for examination perfectly and with our assistance, we can achieve the absolute best. One to one allows this, large classrooms don’t. We realise it can be a very daunting time, and with the chatter from other parents of where their child lies academically, it can raise the blood pressure! That’s where we step in. We will guide you all the way, offering eternal advice and support. There are a lot of schools out there that receive phenomenal reviews and there really are some fabulous schools that we love and support. However, from our many years of experience within the tutoring world and with consistent feedback from in-house classroom teachers, coupled with parent and student feedback, we feel that schools may not be doing enough. Some children get lost and when challenges outside of school interfere with academic work, pastoral care (an ancient model of emotional and spiritual support) does not always pick up on problems as quickly as they ought to. This can have a detrimental effect on the student and their work. One to one tuition gives the absolute care and assistance that perhaps a classroom of 18 children would not all receive individually. We have a 100% track record in gaining access into the best schools in the country and some might say, the world. With this, we continue to strive for excellence with our students and hope that one to one tuition will continue to help students and graduates struggling to meet the demands of their school, college or university. There is no denying of the transformational educational experience offered by tutors, and many parents realise this. For some children, a private tutoring session may be the first time a child has been recognised as an individual, in contrast to the league table-obsessed system they are immersed in. We have constant feedback of increased self-reliance and confidence seen amongst our Bright Star students which, in turn has a positive effect on their school work. This is sometimes because the child has finally felt able to express themselves without the threat of ridicule in the classroom. Private tutors are able to broaden a child’s horizons, act as a role model whilst instilling a love of learning for the world around them and so much more.